Now you can enjoy the flexibility of setting up your ratchet blocks to suit yourself. Ronstan is the only company that offers a ratchet block with both auto and manual engagement modes*. In the auto mode of the ratchet mechanism engages when load is applied, but switches off when it's released. This lets the sheet run out smoothly and freely-great for rapid easing of the sheet and for gybing asymmetric spinnakers. In manual mode, the ratchet mechanism can be switched on or off as required. This is the preferred mainsheet set-up for may top sailors. Try the block in both modes and see which you prefer - you really can't go wrong. Quite simply, Ronstan Ratchet Orbit Blocks™ have the highest holding power available. 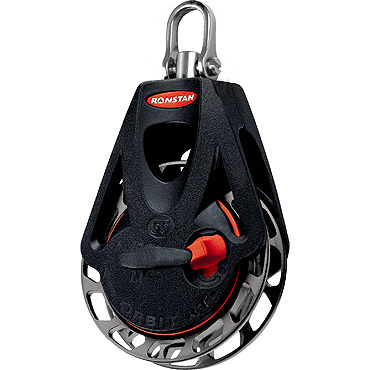 The sophisticated NC-machined sheave features Generation 2 of our patented sheave cross-hole geometry. Its holding power is up to 21:1, almost double that of our nearest competitior. 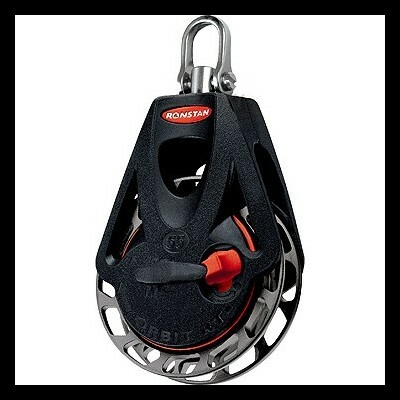 The unique sheave design has 12 gripping faces which directly resist loaded line movement. Traditional designes have only 8 faces with an angled resistance to line movement. Our Generation 2 design has straight resistance faces which both distribute the load and minimise rope wear. These faces are offset from the radial line, to draw the rope down into the gripping area when under load. Sheave : Hard anodised aluminium.